I got an email from our tech wizard Sean Hayford O’Leary this afternoon, alerting me to this notice on the Ole Store website. The building itself was evidently sold a month or two ago to St. Olaf professor LaVern Rippley who owns many houses in Northfield that are rented to college students. Previous PostHow much snow did we get?Next PostDo Android Police Officers Count Electric Sheep? Also, on the county assessor site it claims Rippley owns it, but shows the last sale date as March 2005 — when Todd Byhre and Lindsay Byhre took the place over. Could we simply have a self serve bar…..? Sean, I’d doubt that Rippley would buy the business; just the building. And it happened recently so the details probably aren’t all up to date on the county site. Yeah, I don’t expect Rippley to be involved with the business either, but what I’d heard implied that the potential new owner would be purchasing the building and business. We ran a story a few weeks ago in which the owner laid out the difficult circumstances he faced in keeping the restaurant open, and confirmed that the building was for sale. 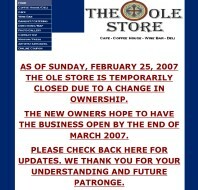 Makes me sad to see the store changing hands so often. Lots of nostalgia connected with the place. I heard yesterday that the new owner, LaVerne Rippley, is indeed looking for someone to operate the restaurant. Those with such a fantasy, and some experience, should follow up. I do have some info on this but negotiations are still in progress.